There is no denying that I am a fried chicken expert. I eat fried chicken more often than most people realize – sometimes 3x in a week, sometimes 1x a month, I mean it varies based on where I am, who I’m seeing, and how I feel about my weight (which, at some point, I’m going to post about my relationship with my weight, but that’s far, far more personal than even my posts about my father, so that might take a while). I eat fried chicken a lot. My personal earmarks for great fried chicken: it MUST be crispy, and it MUST be juicy. The pinnacle of perfection is when the meat is also super flavorful – eaten on its own without a bit of skin, it is still very savory – but I am still happy with crispy fried chicken with meat that might “need” the skin to have more than just simply juicy chicken taste. Cardinal sin when it comes to fried chicken: sogginess, softness. Fried chicken that must NEVER be spoken of again: soggy, soft fried chicken that has never met any type of salt or flavor in its life. Now that we’re acquainted… Hi. I love fried chicken. Over the years, I’ve gone from finding negative reviews the easiest to write, to finding it generally unnecessary to share really negative thoughts about restaurants. It takes far more skill to craft a wonderful story around a beautiful meal, expressing my love for a dish or establishment, encouraging people to visit, than it does to vilify a place for having poor service or not the greatest food ever, overpriced or trendy and hyped crap. It’s no fun to sit and bash a place. It doesn’t bring me joy and actually upsets me to think about a meal that I wanted to enjoy but simply couldn’t. Have I done y’all a disservice by not always expressing my displeasure with places? Probably not, because I am lucky to have mostly good meals on a regular basis, through research, listening to the grapevine and following recommendations/suggestions from friends I trust. I’ve gotten pretty good at picking out the good apples and ignoring the bad ones. Every once in a while, the stars all align and I’ll have a meal that is solidly mediocre, and is at a place heavily praised for one of my favorite foods: fried chicken. I went about my life per usual, but in the past 5 months since I’ve visited, at least 20 people have asked me if I’ve visited Root & Bone, what I thought of the fried chicken, and why haven’t I posted about it. Fine. Although strangely, I don’t have photos of the offending dish, I’m sure you can imagine what it looked like. Even with my awful, poorly lit photos. Jen and I shared a whole bunch of dishes. To start, we had a salad that was truly lovely, if awkward. 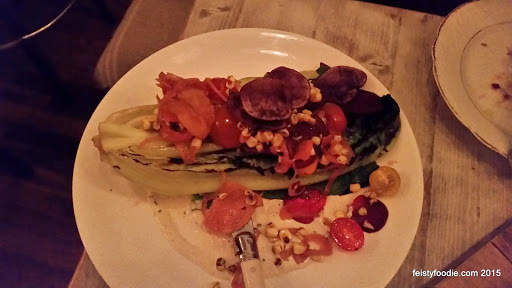 A grilled half head of romaine lettuce that was very unwieldy to cut up, but we managed. I thoroughly enjoyed this – actually, this might’ve been my favorite dish of the night, and though I love a well-made salad, if that’s my favorite in a meal of 5-6 dishes, that’s a problem. Especially when one of the dishes is fried chicken. In any case, I loved the edge that grilling romaine gave it – I’ve been a fan of cooking romaine since I was a child (my mom stir fries it sometimes for a quick veg, and I’ve noticed other people think it’s odd when I dump it into the bottom of my bowl and add ramen on top, but it’s got a light sweetness to it that just works really well). The scattered onions, tomato and cheese were all wonderful complements as well. 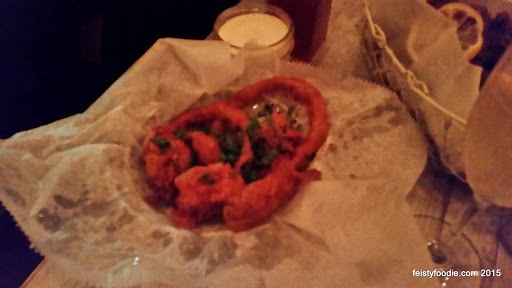 We also ordered a bunch of fried things (onions, and some other veg) – I am sorry for not remembering each item in there clearly, but it was definitely random as Jen and I each ate pieces and tried to figure out what they were. It wasn’t a good sign that this wasn’t fried very crisp, and honestly it seemed an afterthought kind of dish – random veggies they decided to quick dip and fry, see if they could shuffle it off onto unsuspecting diners. I am obsessed with deviled eggs. 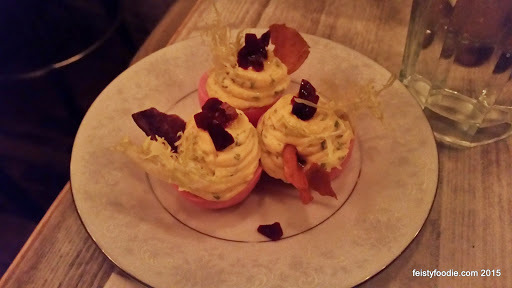 These were good – not as good as mine, but only one place has even come close – I really liked the pickled roots on top. I like texture to my deviled eggs. I recall thinking the white was a little overcooked, but there was so little of it that it didn’t fully matter. The biscuits everyone raves about were only OK, but the jus on the side took them to next level. Honey roasted chicken jus, I would have drank from that little bowl if I could! it was soft. No crunch to the skin, no crisp. Just… soft, sad skin that peeled off limply. I ate my thigh quietly, contemplating what I might’ve done to deserve such sad fried chicken. Well, obviously, the answer is that I fell for the hype – because that’s what it is. Hyped up sad soft fried chicken. Hard pass, guys. Even if every other dish had been rainbows and unicorns, I can’t forgive soft fried chicken. Sad, sad, soft fried chicken. 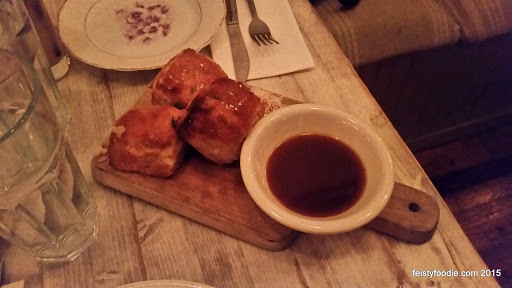 … and now when people ask if I’ve been to Root & Bone, I can say yes, and I posted about it. Onwards to happier, better fried chicken. PS I know a very small number of people who have told me they had good fried chicken there and/or asked for it well-done in order to get it crispy; listen I shouldn’t have to tell you that my chicken needs to be fried properly. That’s just Frying 101. I also know a number of people who really dislike the lemony flavor to the chicken, but that’s personal preference. Seriously… how do you get soggy fried chicken? You weren’t the only person with this complaint either. The kitchen seems to have QC issues. I’ve had a number of people tell me it’s okay. I don’t understand that statement. How is soggy fried chicken ever OK? Even Popeye’s can fry chicken properly. KFC too. I need to try the Honey roasted chicken jus! I went for brunch, and thought it was good but hard to live up to so much hype!